After the prologue of yesterday along 6 km of gravel road with 12 percent average ascending we had the first long leg of the Viking Tour today. Today we had tropical circumstances: over 31 degrees centigrade. Circa 2200 metres of ascending. Bram finished after 5 hours, 11 minutes and 2 seconds. Could have been less than five hours, if Bram wouldn't have lost some time trying to find his glasses which fell out of his bag while passing a cattle grid. Herke missed a rather hidden sign and made an unwanted detour of 15 kilometres. Still, he finished about 15 minutes after Bram. Daniel was about an hour behind, suffering from the heat at Trollstigen. Harsh, beautiful route. See www.vikingtour.no for details and our our Facebook page for pictures. Due to participating in the Viking Tour and subsequent bicycle holiday, M5 will be closed from July 15 up to August 23. Receiving and sending packages will not be possible during this period. E-mail and telephone traffic continue uninterrupted. After a nine year break Bram Moens took up racing again. As part of the preparation for the Viking Tour he participated in two races during Cycle Vision last weekend. Also to his own surprise he managed to get third in the final ranking in a strong field of participants. Bram did the 1 and 3-hour race on his lime green M5 Carbon High Racer. The distance covered during the 1-hour race was a superb 47.3 km, while the 3-hour race ended with 134,4 kilometres, resulting in an average speed of 45,66 km/h (bike computer: 137 km, 45.66 km/h average). Probably needless to mention that most of the other participants where 20 to 35 years younger. Striking detail was that that fully faired velomobiles couldn't really compete with unfaired, open recumbents during the one hour race. 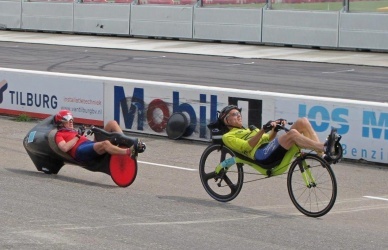 For example, Daniel Fenn did only 47 kilometres during the one hour, while racing a fully faired 3-wheeled recumbent of just 12.5 kilograms on a track which is highly suitable for velomobiles. 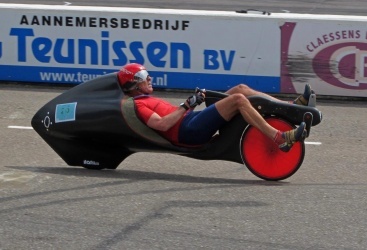 The remarkable achievement by the 71 year old Mike Burrows must be mentioned too: with his partly faired two-wheeled Ratracer he covered 46.9 km in an hour and during the 3-hour race a full 131.4 km. Even without any electrical assistance there's still hope for us! Also check out www.ligfiets.net for all the results, pictures and video's. Especially the pictures of Droplimits are really worthwhile! A short introduction of the M5 Team. All riders take part with their M5 Carbon High Racer which weighs around nine kilograms. Weight is certainly important during the Viking Tour: 13.000 metres of climbing in seven days. More on the Viking Tour on www.vikingtour.no. There's a list of participants, the route and a lot of practical information. Follow the efforts of the M5 Team at www.facebook.com/m5recumbents. Robert Carlier, 39 years, studied mechanical engineering and physiotherapy and now has his own physiotherapy practice. 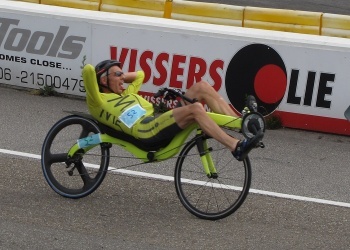 Long distance specialist, currently among the fastest recumbent riders in the Netherlands. Globetrotter, hiked and cycled everywhere on the planet. Fastest Dutchman during Paris-Brest-Paris in 2011. 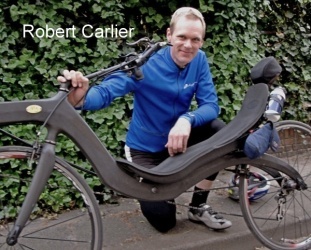 His M5 Carbon High Racer is pretty standard according to Robert. He did shorten the handle bar and mounted bar-ends on it, thus enabling the use of thumb shifters. Wout Ruijter, 35 years, calculated the frame of the M5 Carbon High Racer for series production to obtain the ideal ratio between the use of material (weight) and strength. Tall and fast rider. 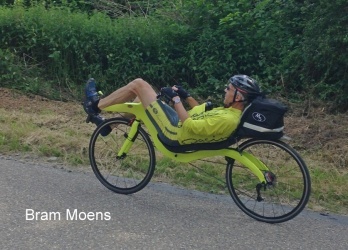 Bram Moens, 57 years, apart from sports, photography and painting a long career in developing and producing efficient recumbents. Keeper of several world records. Picked up racing again for the first time in nine years last spring. Amongst busy working days Bram manages to cover quite a lot of training kilometres, like Luik-Bastenaken-Luik in Belgium. Daniel Siepman, 46 years, working in several IT-related projects and highly interested in ecological building methods. Participates in the Viking Tour with the M5 Carbon Medium Racer, the already ten years old prototype of the High Racer. 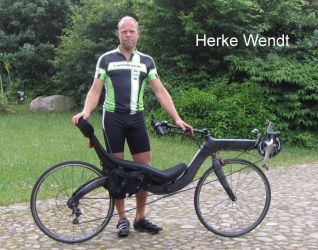 To get a few extra training kilometres he wants to go by recumbent from the Netherlands to the starting point of the Viking Tour in Norway. Making kilometres in The Netherlands, Germany and Denmark and then some climbing in the mountains of Norway. 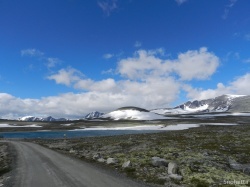 Concerning the Viking Tour: he is somewhat nervous about the 13000 metres of ascending, but maybe even more about the steep, unpaved parts of the Viking Tour. Herke Wendt, 40 years, landscaper in daily life. Covering serious distances with his M5 Carbon High Racer: every Sunday morning a trip of about 150 km and during summer also a weekly evening ride. 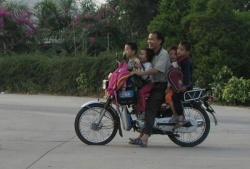 He's fond of his recumbent and would like to make more trips, but being an entrepreneur time is often an issue. To prepare for the Viking Tour he trains a lot in the Teutoburger Wald, because in the flat Emsland there are no mountains. He's considering to cover at least part of the way to Norway by recumbent to get a few extra training kilometres. M5 will also be at Cycle Vision! 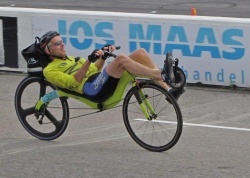 Bram Moens and probably some other M5 riders will participate in the three hour race and there will be several M5 recumbents on the try out circuit. Note that Cycle Vision will be in Limburg this year, this may shorten the travelling distance for international visitors. 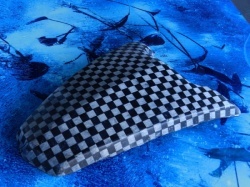 As a test the first samples from the lid template of the newest Tail Bag for the M5 Carbon High Racer and the M5 M-Racer. The small picture shows the classic 3K fabric, while the other has a chequerboard pattern. The last one is strictly speaking not suitable for 3D shapes, but used it anyway. 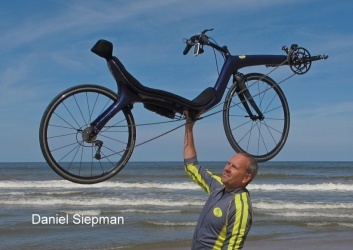 Follow the latest recumbent news even easier and like us on Facebook or follow us on Twitter. This way you'll be notified of the experiences of the M5 Team during the Viking Tour in Norway. But also of the latest novelties of other events, new products and other M5 related subjects. Click on the logo's on the left side of the page! June 1 Bram Moens participated in two races on the cycle track in Peer, Belgium: the one hour race and the 200 metre sprint with flying start. Bram concluded the one hour race with a fourth place. He raced in first position throughout about 70% of the race, which he described as "somewhat foolish" since stayering was allowed during the race. Maybe a podium place had been possible with a somewhat different strategy during the race. Bram was third in the 200 metre sprint. With two more months before the race, I'm doing training laps of 160 km. Thanks to the tuned M5 CHR these are covered with an average of 40 km/h, while manoeuvring through everyday traffic. In my case, to reach 40 km/h (no wind) only a heart rate of 114 is needed. For comparison: I can maintain a rate of 154 for a full hour and my heart rate in rest is around 32. The bike is now equipped with the lowest available seat support of 30 mm, HED-3 rear wheel, Shimano 16 spoke RS 31 front wheel, Continental 4000 S II tyres, Vredestein latex tubes, Lightning Carbon cranks (53-34) of 185 mm, SRAM X-0 10-speed shifters, M5 Topbag of 17 ltr. on a carbon carrier. Very aerodynamic solution, because it blends fully with head/helmet and part of the upper body.